WE WANT YOU TO STAY SAFE. There are very good reasons to resist the temptation of working with comparable materials. We use heavy industrial-grade equipment and have developed a number of processes to contend with the variability inherent in salvaged materials. 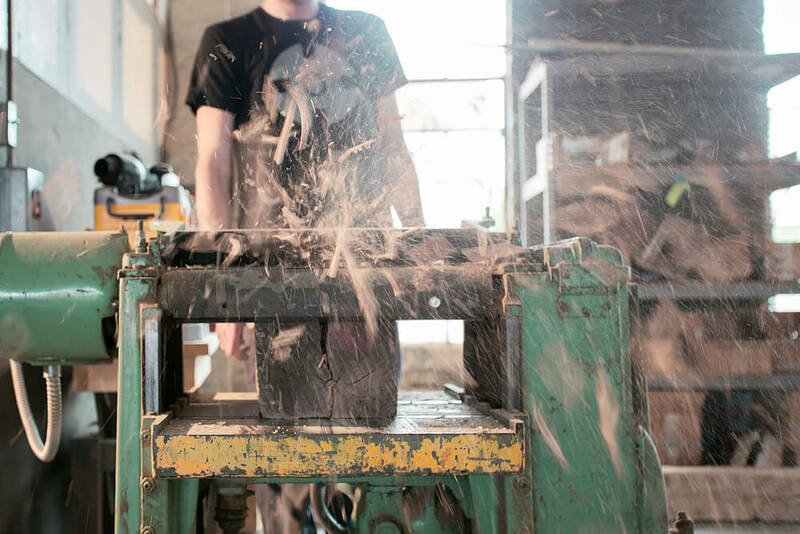 Using home shop tools and/or working with reclaimed materials adds additional risk of personal injury not to mention damage to equipment. As with all heavy equipment use, there is a chance of accidents, but we are very proud of our safety record. Our Design Studio emphasizes working with care and rules are stridently enforced. 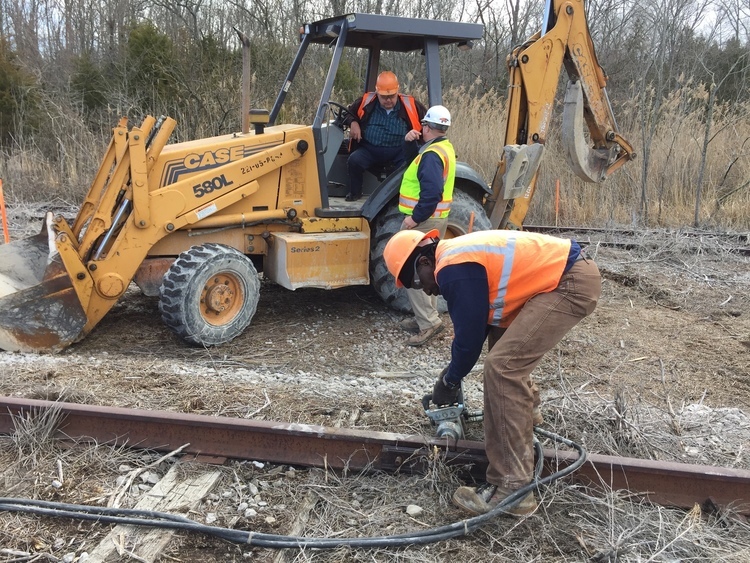 Our professional railroad crews know the dangers and are always cautious. Laid rail operates under tension, and even if it looks like it comes up easily, it can pop and flip during disassembly or simple handling. Let the experts remove the rail. That's what we do. Simple is anything but easy, but we make it look that way. We’ve invested a lot of time and effort in our work to make it safe, well-designed, aesthetically pleasing, and shippable. As such, we’ve taken the extra step of protecting our business and protecting would-be imitators from themselves. If you’ve noticed something that might be an infraction on our patent(s), please reach out to us at [email protected]. The railroad runs everywhere and is often taken for granted, yet it enjoys protections under the law in every state. Rail lines are private property, and trespassers are not wanted or welcome. Let the experts remove the rail. That's what we do. THEFT - Rail, plates, spikes, crossties, ballast (stone) and other track materials are the PROPERTY OF THE RAILROAD. Yes, that includes those spikes you collected as a kid walking along the tracks. Picking up railroad materials constitutes theft, the same as if someone walked onto your property and took the lawnmower left there. Just because someone isn’t around to stop you, doesn’t mean it is up for grabs. RAILROAD EMPLOYEES - The railroads take a strong stance on misappropriation of materials for personal use and/or personal gain. Railroad employees often do not have the authority to grant access to or possession of materials owned by the railroad. TRESPASSING - Trespassing on railroad right-of-ways is not only a crime, but it’s also extremely dangerous. Note: Operation Lifesaver (www.oli.com) is dedicated solely to the purpose of making the public aware of the dangers in and around the railroad tracks. We have a unique situation as a licensed railroad contractor. We are licensed and insured to work within the right-of-way of the railroad, and our business maintains private rail lines. We obtain/have proper title to all of the materials we use. Please help us keep others safe and informed. We love sharing our work with folks and appreciate you doing so. Please feel free to share this page.